There are various options when it comes to deciding on the right activity for your team. Factors including group size and preferences, budget, proximity from the work place and time allocated are just a few of the considerations that need to be taken into account. This is an experientially based approach to team building which caters for all skill levels. What does this mean? It means that we believe that simply sharing an exciting outdoor experience will contribute towards increased cohesiveness within a team. The fun and shared memories go a long way towards creating a bond and some common ground, especially for teams that are made up of a diversity of people. 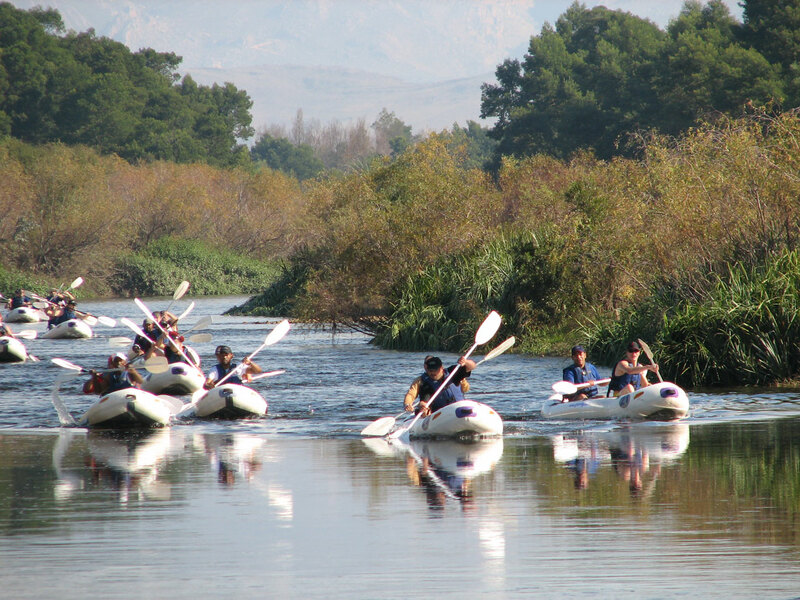 Relaxed day trip on an easy section of the Breede River, near Worcester which is suitable for all skill levels. Fun and exciting – whitewater rafting at high water, tubing at lower levels. From R495.00 for groups, including light brunch and lunch. Add-ons include abseiling, hiking and rock climbing. Sea kayaking on Langebaan Lagoon. Easy paddling in stable sit-on-top kayaks. Please note that these are ball park figures to give you an idea of costs. Contact Sales at Gravity to get a formal quote.